i came across this etsy shop on instagram, and fell completely in love with it. the owner, carly, lives in australia and her shop is full of upcycled clothing! she takes clothes she finds at thrift stores, and embroiders them to make them something new. this shop gets right at the heart of why i started this blog. one of the reasons is because there are too many clothes that are not made responsibly. the other is because we can do with far less than we do. there are so many clothes already in the world. there are so many clothes that end up in landfills every single year. and carly’s shop is a brilliant way to reuse and reinvent clothes that still have a lot of life left in them. my absolute favorites right now are these “sassy pants.” if they were my size i’d have a heckuva time not buying them. she has inspired me to think further about upcycling. 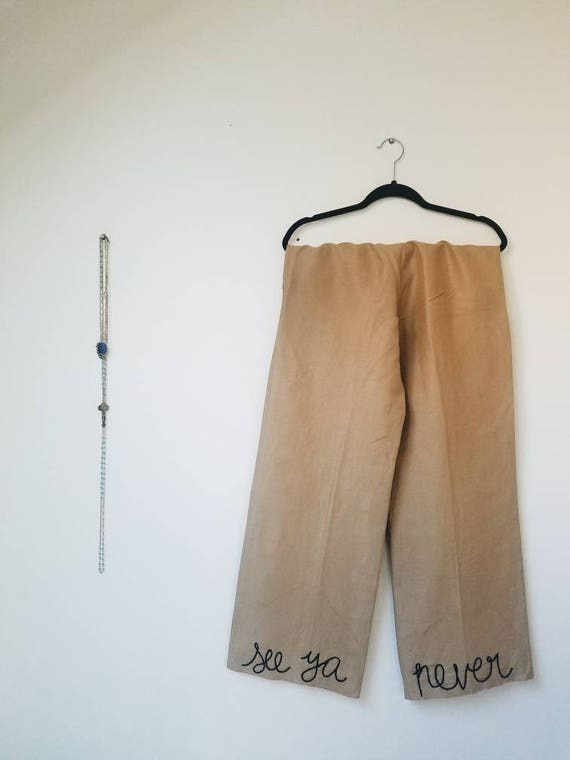 not just how can i reinvent things that are already in my own closet, but inspiring me to reconsider thrift stores from a whole new perspective. if you need something that’s new, but old, go have a look!